Even the older students like to play games from time to time. 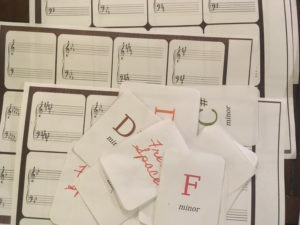 This Key Signature Bingo Game will help your students to learn major and minor key signatures. Played like a regular bingo game. Pick a card from the deck match the key signature on the board. The first one to fill up their board wins! This game is great played at home, at the lesson or in a group setting. The game has 10 boards with key signatures on the grand staff. There are colorful cards with the names of major and minor keys. You can play the game or cut them up and use them as flash cards. Your students will love them. Learning major and minor key signatures is essential for any music sttudent. I want to make sure my students know every major and minor key signature like they are second nature. Read the post "Easy Music Theory"
Piano teaching games are great for reinforcing musical concepts. Sometime an off the bench activity is just what is needed. But this game is great for any music students. You can even use the Key Signature Bingo Game in the classroom. Print it out and have some fun. Your students will be learning and they won't even know it!